Don’t think of these rules as requirements for what to wear in 2018. Instead, think of them as a sign of encouragement. They should make you feel like the fashion world is a democratic community where your outfit choice is your own. We’re just giving you the tools you need to wear your personality on your sleeve when you get dressed. Knowing that blue mixes with black and going sheer is a balancing act doesn’t mean you can’t work a monochrome look or bare your bum in a see-through skirt without investing in the proper underwear — you totally can. We’re only suggesting you keep sophistication in mind, memorise the style codes ahead, and, well, maybe shop a little bit too. In 2018, fashion should make you happy. If we could slap one overarching rule on this post, that would be it. Ultra violet was deemed Pantone’s colour of the year, and we spotted lavender all over the runways. Instead of picking up yet another pair of black slacks, try this happy shade that’ll earn you street style credit. Remember when you styled your beret with a suit, neck scarf, and kitten heels? Freshen things up by working it with a simple blouse and flared jeans. The old you wouldn’t dream of doing that, now would she? The new year is big on colour, glitter, sequins, and texture. 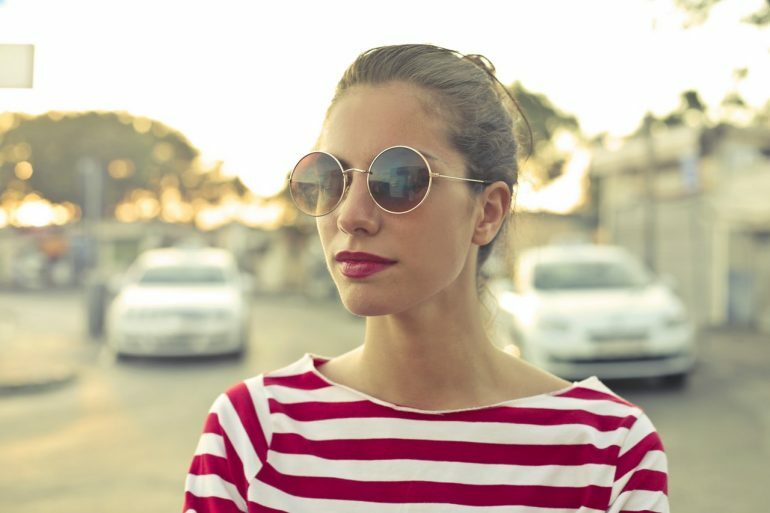 Now is the time to purchase those heart-shaped sunglasses you’ve always had eyes on, but could never rationalise buying before. Let flavourful fashion make you happy in 2018.